The self-driving cars are the latest technology for which many big companies are investing in the present days. Self-driving vehicle (also known as a driverless car, self-driving car, robotic car, autonomous car etc.) is a vehicle that is capable of sensing its environment and navigating without any human input. 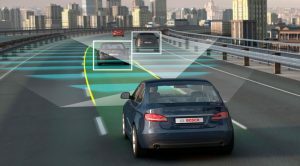 Autonomous cars use a variety of techniques to detect their surroundings, such as radar, laser light, GPS, odometry and computer vision. Advanced control systems interpret sensory information to identify appropriate navigation paths, as well as obstacles and relevant signage. Autonomous cars must have control systems that are capable of analysing sensory data to distinguish between different cars on the road. In 2017, Audi stated that its latest A8 would be autonomous at up to speeds of 60 km/h using its “Audi AI”. The driver would not have to do safety checks such as frequently gripping the steering wheel. The Audi A8 was claimed to be the first production car to reach level 3 autonomous driving and Audi would be the first manufacturer to use laser scanners in addition to cameras and ultrasonic sensors for their system. In November 2017, Waymo announced that it had begun testing driverless cars without a safety driver at the driver position, but with an employee in the car.
. There are many boons and bans accompanying this Technology. The potential benefits of autonomous cars include reduced mobility and infrastructure costs, increased safety, increased mobility, increased customer satisfaction and reduced crime. Specifically there would be a significant reduction in traffic collisions, the resulting injuries, and related costs, including less need for insurance. Autonomous cars are predicted to increase traffic flow, provide enhanced mobility for children, the elderly, disabled and the poor, relieve travellers from driving and navigation chores, lower fuel consumption, significantly reduce needs for parking space; reduce crime; and facilitate business models for transportation as a service, especially via the sharing economy. This shows the vast disruptive potential of the emerging technology. A frequently cited paper by Michael Osborne and Carl Benedikt Frey found that autonomous cars would make many jobs redundant. Among the main obstacles to widespread adoption are technological challenges, disputes concerning liability, the time period needed to replace the existing stock of vehicles, resistance by individuals to forfeit control, consumer safety concerns; implementation of a workable legal framework and establishment of government regulations, risk of loss of privacy and security concerns, such as hackers or terrorism, concerns about the resulting loss of driving-related jobs in the road transport industry, and risk of increased suburbanization as travel becomes less costly and time-consuming. Many of these issues are due to the fact that autonomous objects, for the first time, allow computers to roam freely, with many related safety and security concerns. With the emergence of autonomous automobiles there are various ethical issues arising. While morally, the introduction of autonomous vehicles to the mass market seems inevitable due to a reduction of crashes by up to 90% and their accessibility to disabled, elderly, and young passengers, there still remain some ethical issues that have not yet been fully solved. Those include the moral, financial, and criminal responsibility for crashes, the decisions a car is to make right before a crash, privacy issues, and potential job loss. There are different opinions on who should be held liable in case of a crash, in particular with people being hurt. Many experts see the car manufacturers themselves responsible for those crashes that occur due to a technical malfunction or misconstruction. Besides the fact that the car manufacturer would be the source of the problem in a situation where a car-crashes due to a technical issue, there is another important reason why car manufacturers could be held responsible: it would encourage them to innovate and heavily invest into fixing those issues, not only due to protection of the brand image, but also due to financial and criminal consequences. However, there are also voices that argue those using or owning the vehicle should be held responsible since they know the risks involved in using such a vehicle. A large majority of today’s youngsters fall prey to early deaths due to vehicle accidents. These are These are generally due to human fault rather than machine fault. So what if these machines could take control of the human part of driving? The vision here isn’t just the introduction of some new and attractive technology. It is about bringing about a change that would save thousands of lives, a technology that would make future generations look back at us and say how ridiculous it was that humans were driving cars. It is about being the change the world needs.